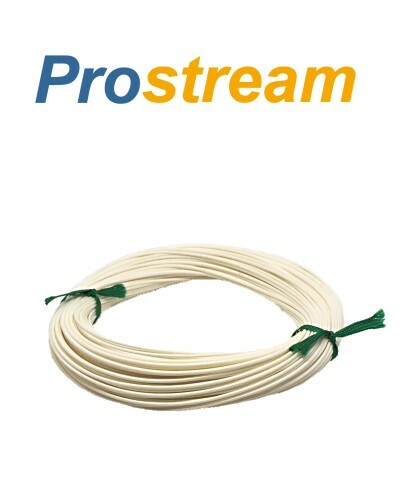 Great value standard fly lines from Prostream that are perfect for fly fishermen on a budget. These new, no compromise fly lines perform with the best and will catch you plenty of fish. - Low stretch braided cores for reduced line memory, improved bite detection and good, solid hook ups. -- White floating lines that are easy to see but don't look unnatural. The floating lines float nice and high in the water. The intermediate lines sink slowly, typically at around 1-2 ips (inches per second). The sinking lines are mid sinkers, typically Type 3 (DI3 or 3 ips sink rate). These are great value fly lines. Well specified and nice to cast, there's very little compromise with these lines and they're definitely the ones to buy if you're looking for a good line on a budget. They'll catch you a lot of fish. Spot on! Good quality for a reasonable price. Once washed and greased the line is very good.